Elise Coventry, Renee Garing, Meghan McDonald, Rocky Cranston, Denby Taylor, Melissa Hickey, Olivia Purcell, Bec Goring and Nina Morrison. Meghan McDonald will go down in history as the first Geelong AFLW player to feature in the All Australian team following a entertaining night at the W Awards in Melbourne on Tuesday. McDonald was named in the back pocket following a dominant season in Geelong's backline. The 27-year-old was named in the Cats best on six occassions, with her intercept marking amongst the best in the competition. 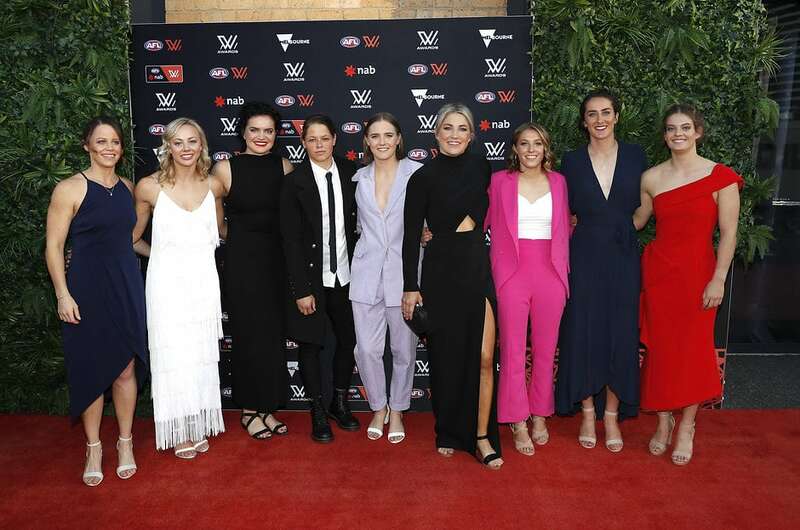 Nine clubs competing in the NAB AFL Women’s Competition were represented in the final team of 21, with 2019 AFL Women’s Best on Ground medallist and dual premiership player Erin Phillips named captain. Taken with selection 14 in the 2018 National draft, Olivia Purcell was recogned for her outstanding rookie season by finishing third in the Rising Star Award. Purcell received 20 votes behind winner Madison Preskpakis of Carlton and Giant Alyce Parker.